Order one for each NC office and location to be fully compliant. The 2019 All-In-One Labor Law Poster will include the following state & federal required posters for all businesses into one laminated 25" x 39" poster. The OSHA poster is included on the North Carolina Complete Labor Law Poster. When you order the North Carolina Complete Labor Law Poster, it will satisfy your State, Federal, and OSHA posting requirements with one poster. 10/2017 - Fair Classification Act - New posting requirement for the state of North Carolina. 04/2009 - Minimum Wage Poster - Update made to Right-to-Work Laws. 04/2009 - OSHA - Update made to Unemployment Insurance and N.C. Workers' Compensation Notice to Injured Workers and Employers (Form 17). 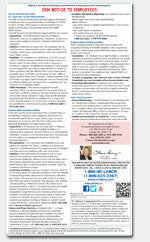 02/2009 - Workers' Compensation - Updated content to reflect employee/employer rights. 01/2015 - Workers' Compensation - Update to workers comp section, minor format revision in the insurance carrier field. 12/2014 - Equal Employment Opportunity Is The Law (EEOC) - Update includes new information on "Employment At Will" law and new penalties for OSHA violations. 01/2014 - Equal Employment Opportunity Is The Law (EEOC) - Update includes a space to fill in Medical Provider information and instructions on how to properly file for workers' compensation. 09/2013 - Unemployment Insurance Poster - This new notice replaces the old Unemployment Compensation panel. 01/2013 - Family and Medical Leave Act (FMLA) - Amendment expands the military family leave provisions and incorporates a special eligibility provision for airline flight crew employees, as well as making some additional regulatory changes. 05/2012 - NLRA (National Labor Relations Act) Poster - NLRB issued a final notice on August 25, 2011, mandating most employers to post the NLRA poster. The enforcement and posting date of the poster has been postponed. Posting date will be announced as soon as it has been published. 03/2012 - Employee Polygraph Notice - New TTY number listed and QR phone reader added. Many industries such as the restaurant, retail, construction, and professional use the North Carolina Complete Labor Law Poster to satisfy their compliance requirements for State, Federal, and OSHA. When posted in an area frequented by employees, the North Carolina Complete Labor Law Poster puts a business in full compliance. Federal contractors and subcontractors are required to display more postings in addition to the general State, Federal, and OSHA regulations. Please click here to see the federal contractor and subcontractor posting requirements. Ensure your full compliance by posting the North Carolina Complete Labor Law Posters with the federal contractor-required postings.